Brent Teter, owner and co-director of TECHS, Inc., addresses first responders Monday evening at the Osage City fire station. 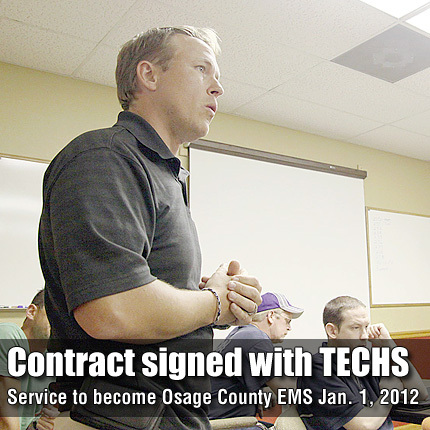 The Osage County Commission opened a brief meeting Monday morning by signing contracts with TECHS, Inc. to take over ambulance service for the county. Commissioners signed a four-year contract for $479,000 per year with the company, which currently provides ambulance service to Jackson and Nemaha counties. The contract completes a motion from the May 23 meeting, where commissioners agreed unanimously to switch to TECHS from American Medical Response, the county’s current provider. “We believe they best suited the bill,” said Osage County Commissioner Mike Pruitt. The decision was influenced by the recommendation of a committee made up of Pruitt, Osage County Sheriff Laurie Dunn, Osage County Health Department Director Anne Gray, Osage County Emergency Management Director Bryce Romine and Burlingame Fire Chief Jim Strohm.